I realized that I missed my week 2 update, but there were two reasons for that. The first is that a power surge killed my laptop’s power supply. The laptop is fine, but out of juice. A new power brick is on it’s way, but until it gets here, I’m stuck with just my iPhone. I’ll probably be skimpy on blog updates until the replacement power supply gets here. The other and more exciting reason is that I’m going to be firing a wood soda kiln tomorrow!! I’ve been working incredibly hard to finish every single piece I possibly can. The past 4 days or so I’ve spent most of 10am to 12am in the studio. (Not counting delicious suppers and fascinating slide presentations by the other artists). How ever, I’ve managed to finish exactly 90 fliers, in addition to some other forms playing with shape and texture! Not bad for a bit more than two weeks. The only downside is having the firing in the middle of my time here, instead of the end. 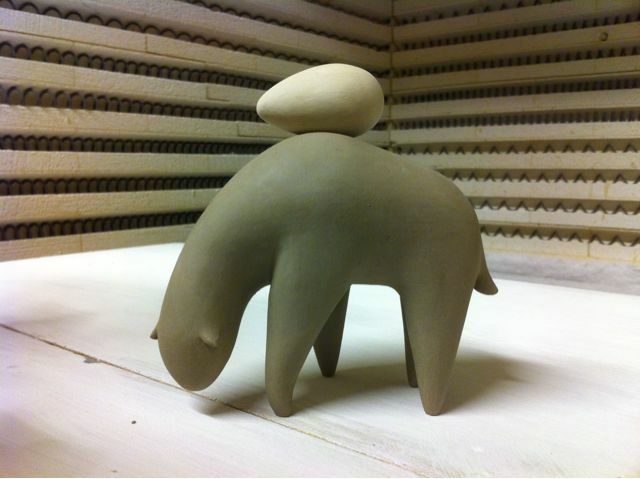 However, I could never fire the kiln by myself, and the girl I’m firing it with leaves on October 6th. We’re firing now so there will be time to cool and unload everything before she leaves. I’ll also have plenty of time to hang all of my flying beasts in their installation. 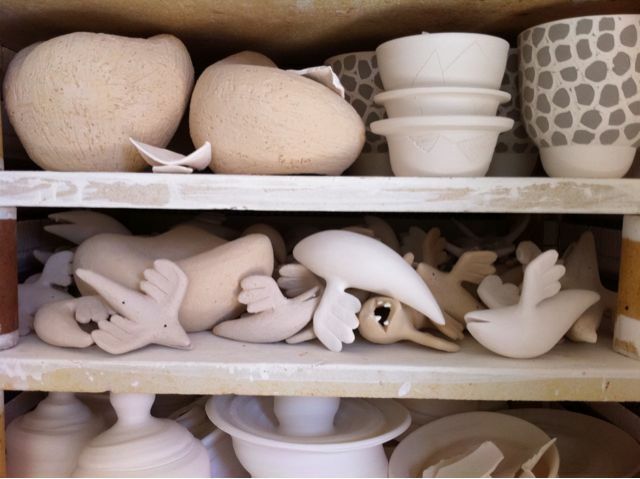 I’ve been considering a number of different things to work on in my remaining time here, after the soda firing. I keep changing my mind every 5 minutes. I’d like to play with color on white porcelain some, and see where that goes. Or I could spend some time making quick rough monsters, brainstorming with new forms on a larger scale. I’d use the cheapest clay, and scrap them all at the end, just making as many new forms as fast as I could. There’s just so many possibilities!! Another Passion is an excellent Seattle art blog. It features local artists, musicians, and general creative types, along with musings on creativity in general. Also, this week it features an interview with me! I’m pretty excited to be on there. It was also a real treat to meet the guy behind it, Rasmus Rasmussen! There’s been a few things I found recently that seemed worthy of passing along. First off is the mysterious myspace artist known as Milk / Logyu. I found her work a little while ago due to random site called NotCot. She has no portfolio site, or really any information out there. There’s pretty much only her myspace profile that tells you that she’s 32 and from Tuscon, and her mind blowing work. What I love so much about it is her use of tiny continued themes, such as her skeleton birds, cards with hearts, and mp3 players. Have fun perusing her fascinating work. I wonder if her work only exists in the digital world? Next is an oddly equally fascinating medieval beastiary. It’s truly fun to explore. It has a huge list of creatures, with each one having examples of medieval art and an explanation of what it was, along with bibliographic sources for the earliest references. Sure, it has all the standard creatures like hyenas and dragons, but it also has weird ones like … Barnacle geese?? And also, who knew that asps were originally lion- like creatures that guarded trees. To avoid being lulled to sleep by music, the asp would keep one ear pressed to the ground, and the other plugged with its tail. The one other thing worth passing along is that I’ve been working to clear out my flickr backlog. I have unsorted and un-uploaded photos that go back to the last fourth of July. So if you follow my flickr feed, please enjoy chronologically random stuff that should be showing up over the next bit or so. It’s been a long week. I finally have all the work photographed, sorted, titled and captioned. I’ve even sent off the first boxes to galleries and costumers. The photo is from Monday, when I’d been pushing really hard to get off an application to an emerging artist contest thing. I was going to just keep working on stuff on my laptop, but between the soft pillow and the soft cat, I didn’t stand a chance. However, everything is now finally up! Enjoy!